You might ask how this data is created. Chitika is an ad network that shows ads on a number of websites around the world. Due to the popularity of the ad service, millions of ads are displayed daily and with that data, Chitika is able to tap in to it to see what devices are running what OS. You’ll notice that the graph starts the day before where you can see less than a 1% adoption rate. This low part of the graph will represent developers running iOS 6 which has been available in beta form for a few months now. 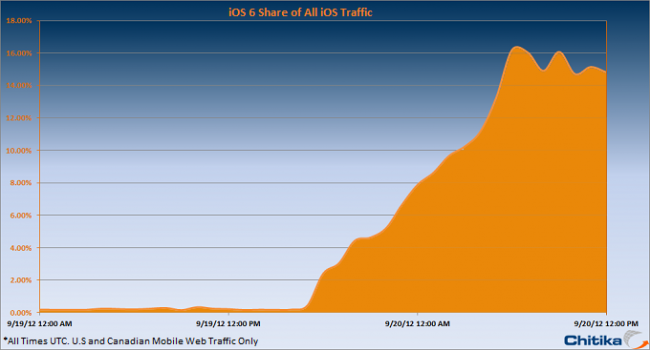 You can then see the exact point at which iOS 6 is made available and how quick the graph rises. If you are interested in a weekly update on adoption rate then David Smith, an iOS developer, regularly updates a graph showing what percentage of users of one of his popular apps have adopted what versions. At the moment his numbers show that 13.2% have updated. This was updated on September 20th, so seems to sit about right with Chitikas numbers (this was probably captured an hour before their data).